(Beyond Pesticides, March 20, 2013) Loss of habitat to genetically engineered (GE) cropland, as well as increasingly warm temperatures are responsible for the dramatic decline in Monarch butterfly populations, according to scientists who say populations are the lowest they have seen in two decades. This comes as the state of pollinators continues to reach crisis levels, with honey bee colonies also experiencing alarming declines. Scientists who take the annual measure of Mexican forestland famously occupied by migrating monarch butterflies find that forestland occupied by the butterflies, once as high at 50 acres, dwindled to 2.94 acres. This is a 59 percent decline from the 7.14 acres of butterflies measured in December 2011. The survey carried out in December and January, reported nine monarch colonies wintering in central Mexico, occupying a total of 1.19 hectares, or 2.94 acres. The results were released by the World Wildlife Fund-Mexico, and Mexico’s National Commission of Natural Protected Areas (CONANP). 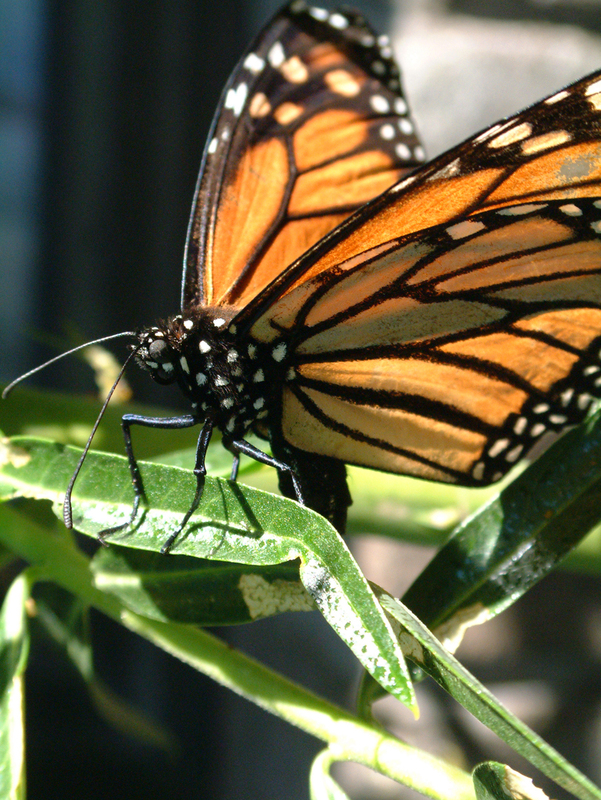 This population is the smallest recorded since the Monarch colonies came to the attention of scientists in 1975. To explain this drastic decline, researchers point to the loss of Monarch habitat in the U.S. and Mexico to increasing cropland and the widespread use of the herbicide glyphosate. Historically, for butterflies in the U.S., their key source of food, milkweed, was typically found in several key states where the butterfly feeds and breeds: Iowa, Minnesota, Wisconsin, Illinois, Indiana, parts of Ohio and the eastern Dakotas. But now fields have been planted with more than 120 million acres of corn and soybeans genetically engineered to be tolerant to glyphosate, and many other herbicides, allowing farmers to use glyphosate to kill milkweed in the field. According to the researchers, the utilization of these GE crops has all but eliminated milkweeds from these fields, thus eliminating the butterfly’s source of food. A rapid expansion of farmland ””more than 25 million new acres in the United States since 2007”” has eaten away grasslands and conservation reserves that supplied the Monarchs with milkweed. Milkweed was once widespread throughout the U.S., but is considered a nuisance weed by farmers throughout the Midwest. Also contributing to pollinator decline is intensive farming that reduces the area from the edge of the road to the field and management of roadsides with the use of herbicides (and excessive mowing) that also eliminates milkweeds. Loss of habitat through development of forestland also consumes 6000 acres at day or 2.2 million acres a year. Warmer weather is also cited by the researchers as impacting Monarch populations. Hot and dry conditions, which were observed in 2012 throughout Monarch habitat, have the effect of reducing adult lifespan and the number of eggs laid per female over their lifetime. Monarch butterflies make their way from the U.S. and Canada, usually arriving in Mexico around the beginning of November, clustering by the thousands in the boughs of fir trees. Although the same trip occurs every year, no individual butterfly makes it twice, as the butterfly’s life span is too short. How the migration route lives on in the butterflies’ collective memory is an enduring scientific mystery. Researchers note that to compensate for the continued loss of habitat, refuges of milkweed must be set up to provide a source of food for butterflies. Pollinator populations have been hard hit by new farming technologies. Similar to Monarch butterflies, honey bees and other wild bees have also been experiencing a drastic decline in numbers that has been linked to the prevalent use of highly toxic herbicides and insecticides that have not been fully evaluated for their effects on insect pollinators. Recently, the American Bee Journal reported that almond growers in California may not have access to the honey bee colonies necessary to pollinate this year’s crop, due to heavy losses experienced by beekeepers. Honey bees face numerous challenges from agricultural exposures to neonicotinoid insecticides, linked to impaired bee foraging, learning and navigational behavior. Contaminated pollen, nectar and dust expose bees to pesticide residues that are taken back to the hive, impacting colony health and survival. Join us April 5-6, for Beyond Pesticides’ 31st National Pesticide Forum, where New Mexico honey bee inspector, president of the New Mexico Beekeepers Association, and a beekeeper for over 30 years, Les Crowder, will discuss organic and natural solutions in beekeeping for problems commonly treated with chemicals, and the role beekeepers play in protecting biodiversity. Organic agriculture, beekeeping, resilient food systems, pesticides and much more will be discussed. Space is limited so register now. This entry was posted on Wednesday, March 20th, 2013 at 12:01 am	and is filed under Genetic Engineering, Pollinators. You can follow any responses to this entry through the RSS 2.0 feed. You can skip to the end and leave a response. Pinging is currently not allowed.